Christmas markets. One of my favorite things about the holiday season is Christmas Markets or “Weinnachtsmarkt” as they are called in Germany. 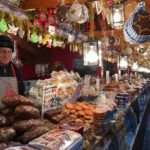 These popular markets typically run through the four weeks of Advent that lead up to Christmas Day. The markets originated in the late Middle Ages in Germany, Austria, France, and Italy. Now Christmas Markets are in place all over the world. We even have several right here in Chicago. If you like good food, hot drinks, and unique vendors with many handmade goods that make terrific holiday gifts then Christmas Markets are definitely a must for you! I was the guest of Baden-Wurttemberg Tourism Board on a recent press tour of the area. I was not financially compensated and all opinions are my own. Warning: there are lots of photos of food, gluhwein and fun being had at 7 wonderful German Christmas Markets. These photos will undoubtedly cause you to immediately feel the holiday spirit. Stuttgart is a wonderful city to visit. The city center has many pedestrian-only avenues, which makes walking around the Christmas Markets very easy and safe. The surrounding office buildings and businesses add to the ambiance with their festive lights and displays. Every market has a special feature and Stuttgart has creative and unique rooftop displays on every booth. In fact, there’s a competition for the very best. Just wandering around taking in the displays is a sheer joy. I was also lucky to catch a live musical concert at the Old Stuttgart Palace the evening we visited. It was magical to watch the performance in the courtyard amid the sparkling lights. 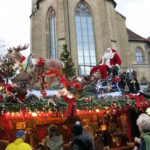 Stuttgart is regarded as one of the best Christmas Markets in Europe. The 300-year-old market features over 280 decorated stands that are all unique and beautiful. There’s also a separate Children’s Market where kids can make ornaments, ride the giant Christmas ornament Ferris wheel and take a little journey on the miniature train. Special bonus: free Wi-Fi is available throughout the Stuttgart Christmas Market. A perfect benefit for those who can’t wait to share their magical moments with friends at home on social media. Rooftop Decorations Are Unique In Stuttgart Christmas Markets. 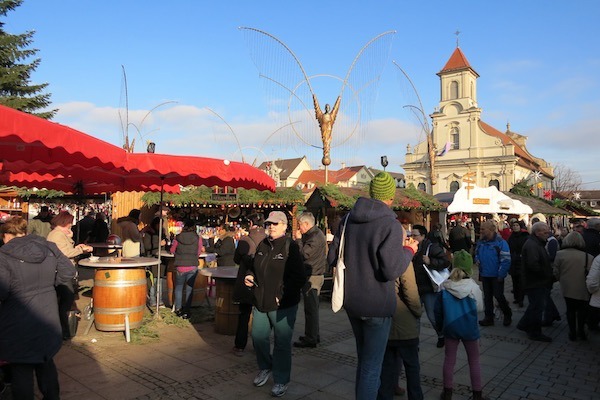 The first thing you notice at the Ludwigsburg Christmas Market is the array of giant angels with sweeping wings that seem to hover over the market observing and protecting it. Two baroque churches grace the Ludwigsburg town square. 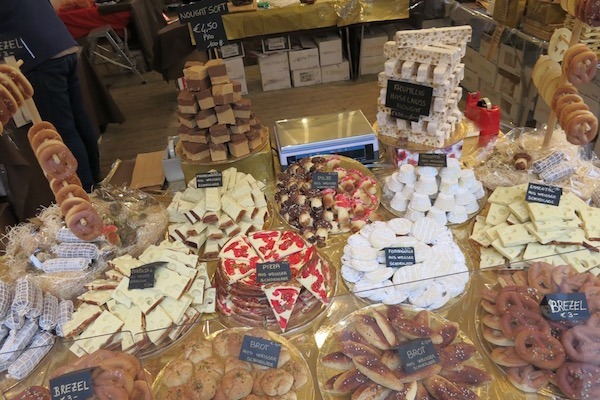 With over 175 stalls you’ll get lost in the tasty treats, handcrafted local goods and fragrant booths. It’s a must to try the Ludwigsburg Lebkuchen. 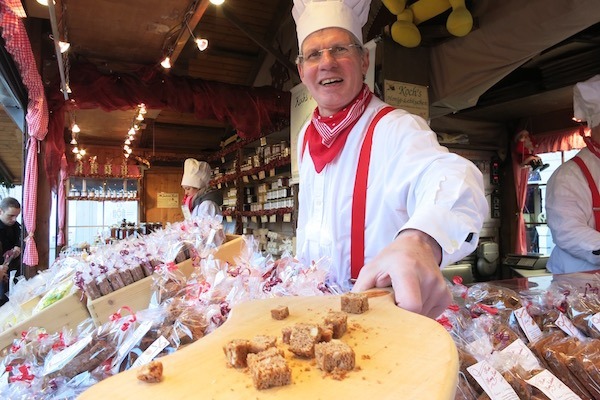 The vendors hand out samples and boast about their World’s Largest Gingerbread, which has been registered in the Guinness Book of Records. By far the most unique Christmas Market we visited, Esslingen’s Medieval Market transports you back to the Middle Ages. The vendors dress in historical costume and at times you’re convinced that you’ve truly stepped back in time. Over 200 booths make it easy to enjoy a variety of favorites. 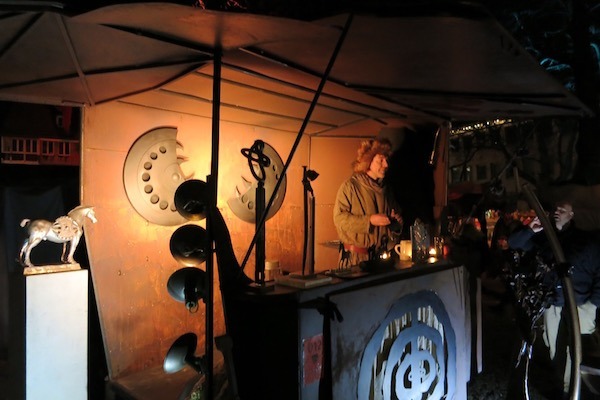 You can watch blacksmiths, basket weavers, jugglers, archers and more while sipping hot mulled wine and munching on the same food that was enjoyed by revelers hundreds of years ago. It’s a treat to walk around the timbered houses and watch the show unfold. 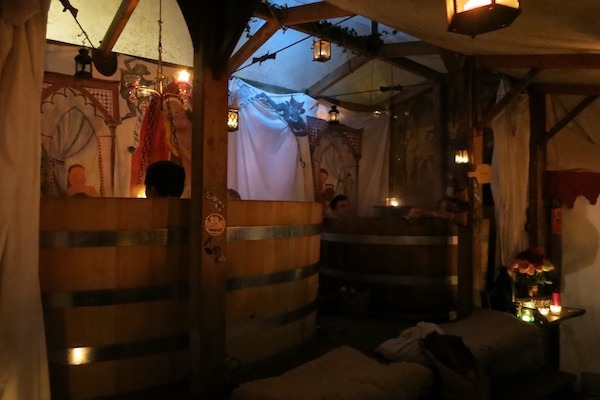 My favorite stall was the “baths.” Here you can take a hot bath with several friends while still enjoy your food and drink. Unique, you bet! 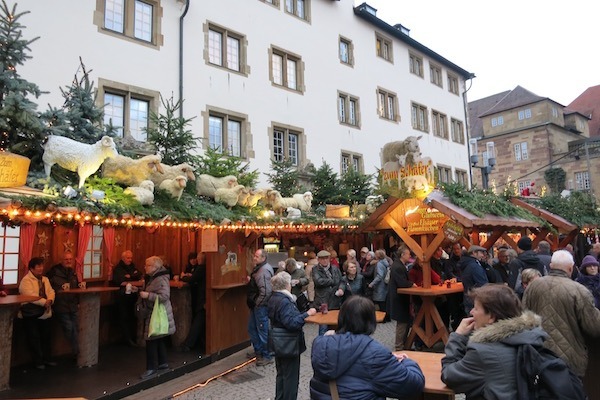 Located in the university town of Tubingen the Chocol’ART Christmas Market is celebrating its 10th anniversary this year. 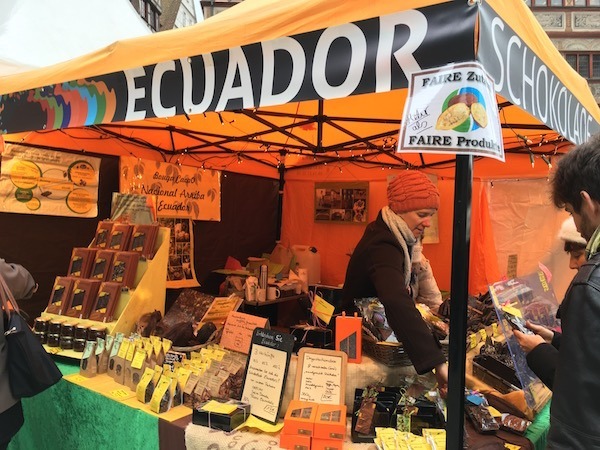 International chocolate vendors from Africa, Ecuador, France, Belgium, Italy, Switzerland, Germany, and others come together to celebrate everything that’s Christmas & chocolate. The Chocol’ART Christmas Market winds its way around the Old Town City Center as you taste your way through chocolate from all over the world. It’s the only chocolate market in Germany and only happens one weekend in December so be sure to check the dates when planning a trip so you don’t miss it. As you approach the Hohenzollern Castle from a distance you are struck by its massive size. It looms over the forest and you are just as awestruck as the villagers must have been when the castle was the ancestral home of the Prussian Royal family that inhabited it. 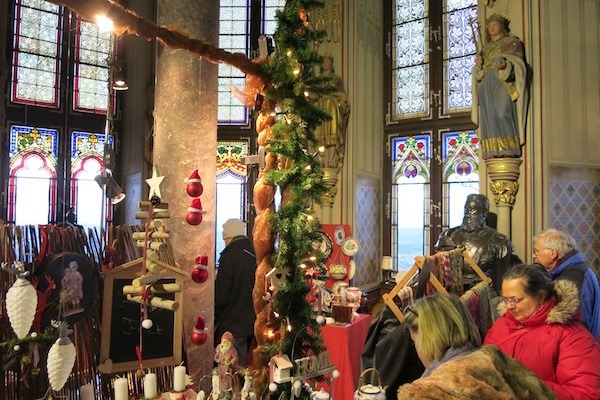 One of my favorites, the Royal Christmas Market at Hohenzollern Castle has all the stalls you’d expect at any Christmas Market but you’ll be pleased to browse the locally handcrafted gifts in the castle itself. It makes for a very special journey as you take in the sights and find special treasures along the way. Don’t forget to tour “treasure room” with the historical items that include Frederick the Great’s snuff-box, and the original garment that legend says saved his life from a bullet. 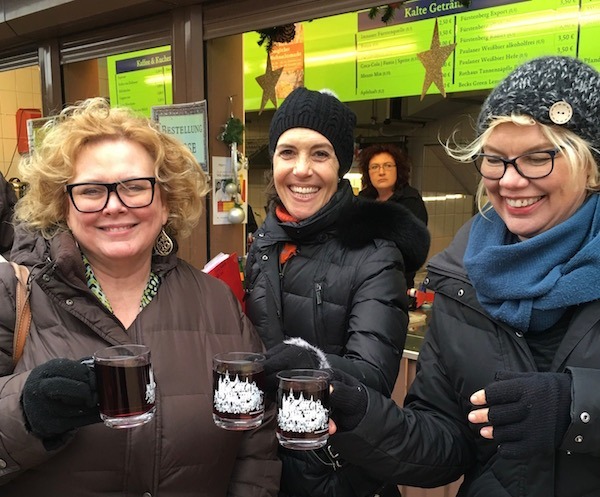 Gluhwein Cheer – Another Way To Stay Warm. Located along the Alb River in the Black Forest. When you arrive in St. Blasien you immediately see the beautiful domed abbey church built in the Early Classic style. This was by far my favorite Christmas Market in Baden-Wurttemberg. 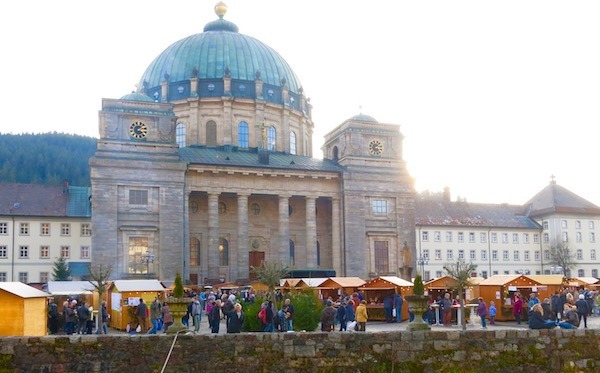 The Christmas Market is located right in front of the large domed church. This town seems to be protected by the surrounding Black Forest. Families stroll and stop for cups of hot cider and wine. The pace is relaxed and orderly, no rushing around even on a Saturday afternoon. For over 60 years the market has been the home to local vendors creating very unique gifts and wares. Take the time to visit the abbey the “white church,” as it’s come to be known, is not to be missed. 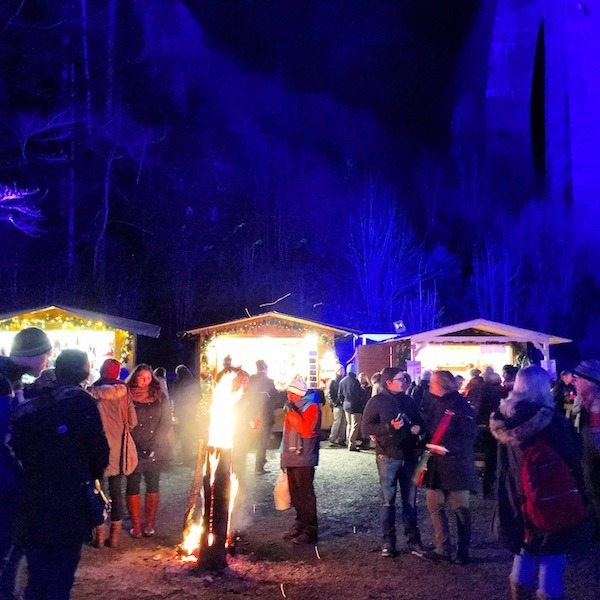 The most dramatic Christmas Market in the area is definitely the Ravenna Gorge Christmas Market. 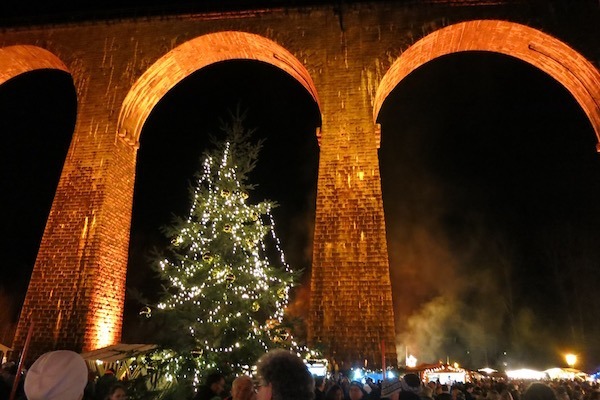 Set under the ancient stone viaduct of Germany’s steepest railway bridge in the midst of the Black Forest this Christmas Market is one you won’t soon forget. The viaduct is specially lighted and changes colors every ten minutes. 40 stalls sell locally made one-of-a-kind handcrafts and regional products. 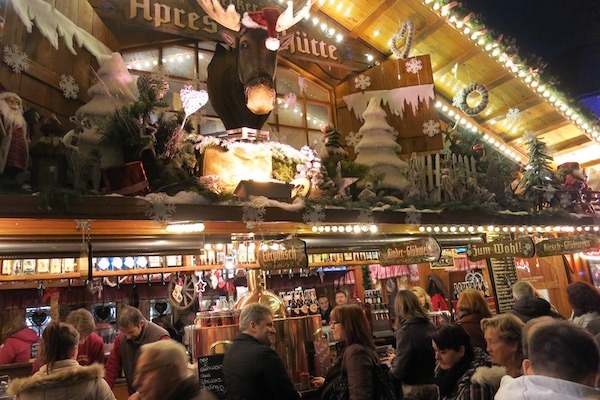 Live music and lots of food and hot beverages make the Christmas Market a very lively scene. The Ravenna Gorge is a short walk from the Hofgut Sternen Hotel where the German poet Goethe once stayed. Be sure to stop in one of their gift shops for a large selection of handmade cuckoo clocks, beer steins, Christmas ornaments and home decor. As you can see there are many different types of Christmas Markets in Germany but they all have one thing in common – FUN! 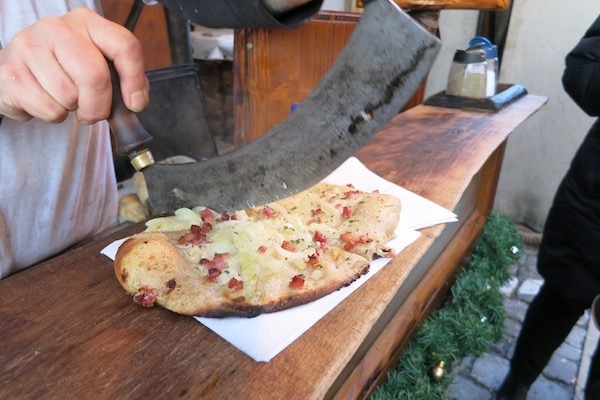 If you can’t find something tasty to eat & drink at a Christmas Market you’re just not trying. 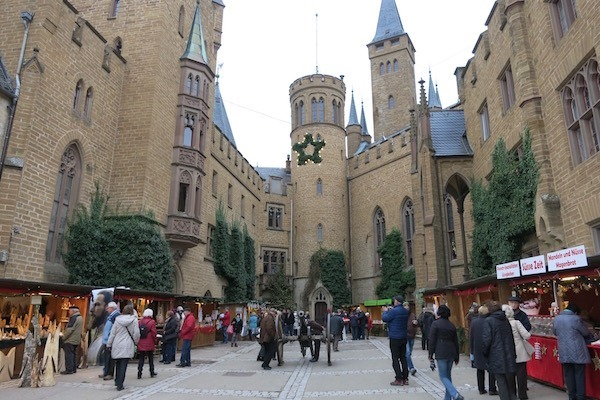 They’re also a great place to be part of the local German culture and pick up some handmade holiday gifts. 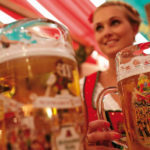 Whether you spend a week exploring many Christmas Markets or just visit one you’re sure to have the time of your life. Dress warmly and wear comfy shoes so you can stay outside and enjoy every minute. 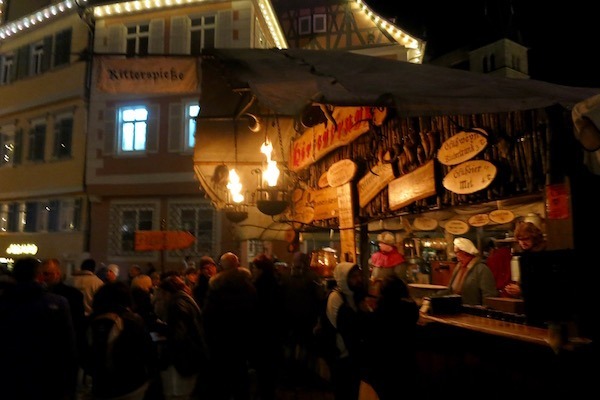 You must try a cup of hot mulled wine known as “glühwein” and be sure to try one of the many grilled sausages, flammkuchen (flatbread with cheese and a variety of toppings), magenbrot ginger cookies and whatever other local delicacies you can find. Have you ever been to a Christmas Market? Tell us about your Christmas Market experiences in the comment section below. 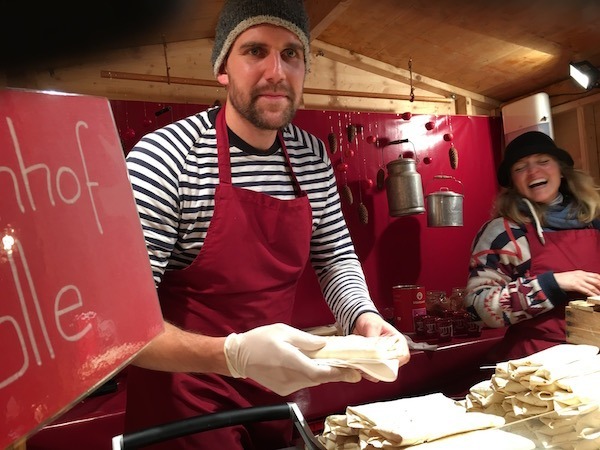 THE QUICK BITE: We explore 7 beautiful and tasty Christmas Markets in Baden-Wurttemberg, Germany. See why every market is different and what to expect when you visit. Definitely a dream of mine to do the Christmas markets. Thanks for sharing all the lovely photos. I love a good Christmas market…a good one. Love your pics. Fantastic. A river cruise is on my wish list for 2016, especially with Viking after I cruised around the Mediterranean Sea on Viking Star earlier in December. Great post with great photos of German Christmas Markets. Pinned a bunch to Santa Fe Travelers Pinterest Christmas Markets in Europe board. Glad you enjoyed in Billie. Thanks for the pins much appreciated! 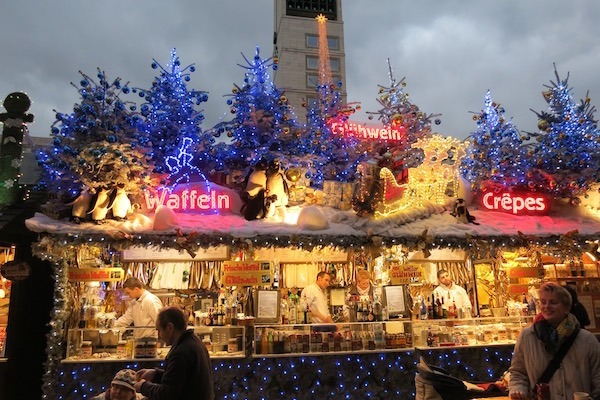 What a great selection of Christmas markets to choose from. I love the Stuttgart rooftop displays and it would be fun to visit the medieval market. I’ve been to a German-inspired Christmas market in Vancouver, Canada. It had some of the spirit of the markets you’ve highlighted, but I would like to get to a real German Christmas market some day. Stuttgart is very special. I hope you get to visit a Christmas market in Germany one day you will absolutely love it. 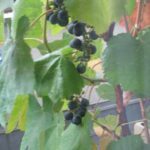 We love Ludwidsburg and have friends who live close by in Hochdorf. I would love to visit at Christmas time and was so interested in your photos. How magical! The core of Ludwigsburg was built around the Square as housing for the craftsmen who worked on the Palace. We were fortunate to have our friend arrange for a special, private tour of the Palace on a day it was closed to the public. Just an amazing tradition of culture and history. How lucky Betsy! We also toured the Palace it is spectacular. I would love to return and see the grounds during the blooming months. I’m sure it would be spectacular. I loved exploring Germany’s Christmas markets a few years ago and would definitely return in order to be able to explore more of the food — much of it is available only during the holiday period. 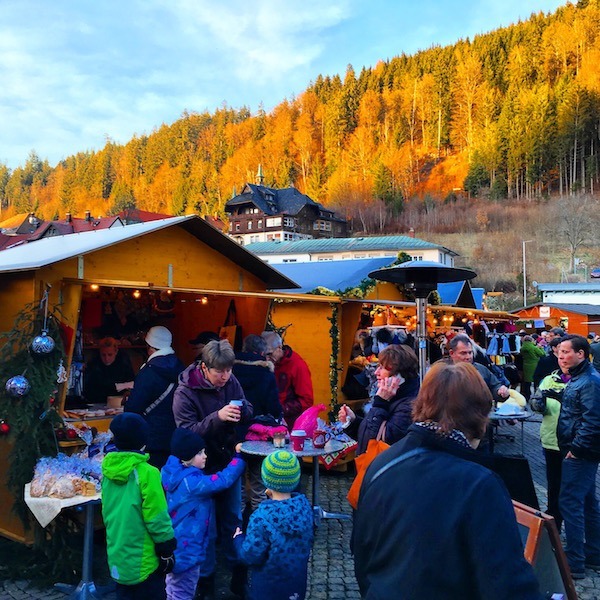 That Christmas Market in the Black Forest looks especially unique! 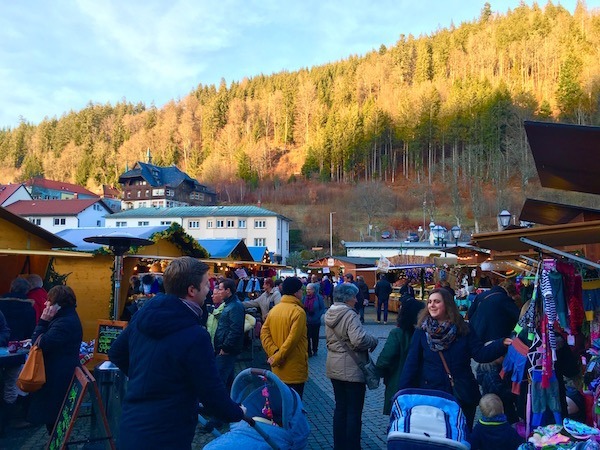 I just the Christmas Markets too and the St. Blasian market in the Black Forest was really magical. Thanks for stopping by Michele! Your warning, “These photos will undoubtedly cause you to immediately feel the holiday spirit” made even a scrooge like me feel festive! I especially loved the rooftop displays in Stuttgart but each of these markets look like fun and unique experiences. Thanks Anita! I especially loved the impromptu singing of carols and holiday music. Many of them sang in English and did a great job. We love Christmas markets and these look fantastic. Haven’t been to any in Germany though. That should be next for us. You two would have a wonderful time at the German Christmas markets. I see the 1/2 meter sausage in your future. Oh my goodness; when you travel at Christmas, you do it up right!!! Awesome article and photos!! Thanks Marilyn! It was a wonderful trip. Thanks for stopping by. Gingerbread!!! Love it! Chocolate!!! Love it! Hot cider and wine!! Love them! 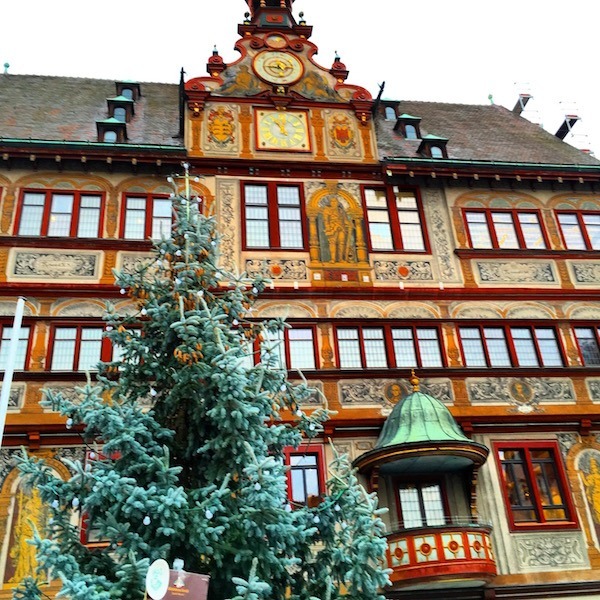 Christmas markets in Europe….I have to do more of them. (P.S. I hate your pictures because they cause me to want to eat). Oooh! I’ll have to search for that PBS special I can’t get enough Christmas Markets! Thanks for stopping by Irene.